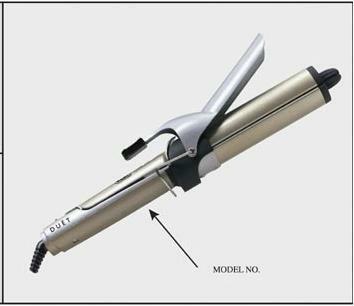 WASHINGTON, D.C. - In cooperation with the U.S. Consumer Product Safety Commission (CPSC), Wahl Clipper Corp. of Sterling, Ill., announces the recall of 6,000 “Duet 2 in 1 Hair Styler with 1 ½ inch barrel” curling irons. The electrical insulation in the curling irons may break down, resulting in a possible electric shock and injury to the user. Wahl Clipper Corp. has not received any reports of electric shock or injury related to this product or defect. The recalled curling iron package reads “Duet 2 in 1 Hair Styler with 1 ½ inch barrel.” Two model numbers are involved: 5266-500 (sold in a plastic package) and 5266-500B (sold in a box). The curling irons have a gold and silver handle with gold barrel and silver clamp. The words “Wahl” and “Duet” are on the handle of the curling iron. The product was made in China. Wahl Clipper Corp. sold the curling iron for about $20 to $22 in discount stores, drug stores, and online, from May 2003 until September 2003. Notice and Disclaimer: The information provided in these pages is preliminary and informational only. No liability is offered or assumed for inaccuracies in this information. Please check with the federal Consumer Product Safety Commission to confirm the completeness of all information provided.